The island-city nation of Singapore has long maintained an influential position within the South-East Asian region and continues to do so, from its latter day traditions as a major regional trading post to that as a modern-day economic powerhouse. 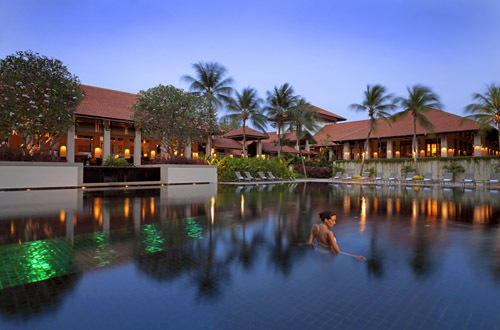 Connected to the southern tip of the Malay Peninsula by a small land bridge Singapore is certainly amongst the most dynamic and sophisticated destinations in the region. The ultimate in orderliness and modernity, with chic and suave elegance existing side-by-side with ancient culture and tradition aplenty. Singapore is immaculate and a joy to experience. The city offers World-class food, drink and nightlife in abundance. Gleaming modern skyscrapers are testimony to Singapore\'s enduring legacy and success. First-Class in every sense with an efficient and slick urban transportation and road network that is the envy of many a Western pretender. Chinatown - A Singapore heritage site located just behind the skyscrapers of Singapore\'s financial district with sights and sounds like no other. Fortune-tellers and tailors are as much a part of the street life as temples and tea houses. The shophouses along Smith Street have been carefully restored to retain their original look and uniqueness. In the evening Chinatown transforms into a bustling food street with locals and visitors feasting on the many local dishes available here. The Tanjong Pagar area houses traditional shops with modern shops located at the junction of Cross Street, New Bridge Road and Eu Tong Street. Little India - Perhaps the most colourful of Singapore\'s ethnic neighbourhoods with shops selling Bollywood DVD\'s and southÂ Indian produce. More akin to actually being in India itself but all arranged in a neat and unique Singapore package. Arab Street - A notable contrast to Singapore\'s shopping malls and department stores with many bazaar-style shops offering handicrafts and textiles. The Sultan Mosque is probably the biggest tourist draw. Modest dress should be worn before entering. Orchard Road - World famous epicenter of Singapore\'s shopping and entertainment industries. This is a \"shoppers paradise\" that rarely sleeps. Also a great haunt for excellent fine dining, classy restaurants and bars. Singapore River - Singapore\'s past, present and future all come together here. Visitors can follow the riverbank on foot or make the return journey by on one of the river\'s famous \"bumboat rides\" and cruises passing centuries-old godown warehouses and shop-houses. Robertson Quay, Boat Quay and Clarke Quay are home to some of the cities lively shops, wine bars, al fresco bars and restaurants with waiters plying for trade as potential patrons pass leisurely by. By Air - Singapore Airlines offer direct flights from Heathrow and Manchester, and British Airways and Qantas have direct flights from London, journey time is approximately 12 hrs. There are numerous indirect flight options also available, including regional departures via Amsterdam with KLM. Local Transportation by MRT - The Mass Rapid Transit (MRT) system is probably the fastest way to get around Singapore. The MRT provides scenic views of the heartland and city areas, with great access to almost every part of Singapore. Taxi Services - You can hail a cab without any problems in most parts of Singapore. It is best to get a cab from one of the numerous taxi stands in Singapore including those at hotels and shopping centres. Singapore has a hot, humid climate with temperatures reaching 30°C and night time temperatures rarely falling below 20°C. November and December have the most rainfall, although brief rain showers are expected throughout the year. 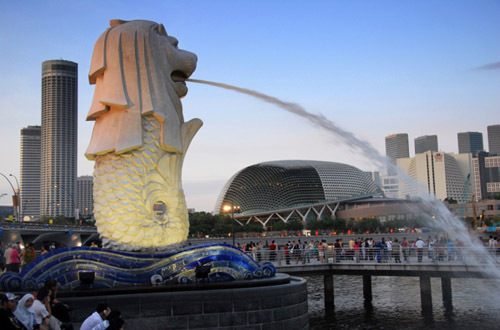 The four official languages of Singapore are Mandarin, Malay, Tamil and English. Precautions against hepatitis A, typhoid and polio recommended. Please consult your GP for up to date information. Singapore dollars (S$). US dollars, sterling and euros accepted along with major credit cards. ATM facilities are widely available.